These beautiful pocket angels were specially crafted by Stars and Stripes to honor our service men and women with a unique keepsake. On the back of each coin, it reads "Safe in the hearts of all who love you." These coins are in stock and ready to ship. 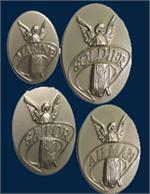 Embossed with SOLDIER, SAILOR, AIRMAN or MARINE, each coin is 1-1/4" high by 7/8" wide and 2mm thick. Coins are sold in sets of four each of the same military branch or in a set of four that includes one of each branch. Each set of four comes packaged in an organza pouch (please specify silver or red pouch), perfect for giving any time. © 2019 Stars and Stripes, All Rights Reserved.